"What is 'Graduate Students Against GSWU?' Are you connected with the University?" We are a self-organized group of graduate students with no financial backing from or connection to the University of Minnesota's administration, or any other group. 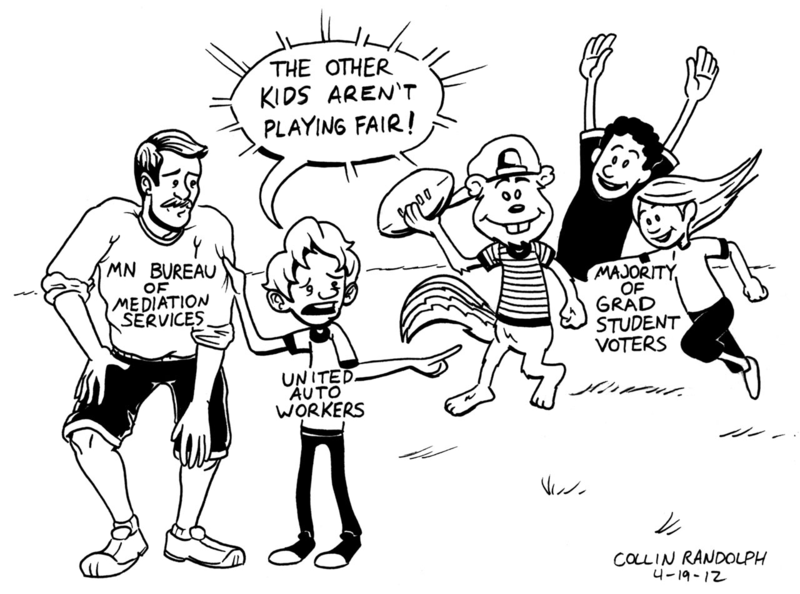 We're just a group of busy TAs and RAs who have serious reservations about being represented by the United Auto Workers. If you share the concerns that we've voiced here and want to make a difference in the upcoming election, please "Like" our Facebook page. We'd also be really happy to hear from you (email us). We also like to point out that we respect every GA's right to privacy and whether you want to get involved in flyering, chalking, tell us about your experiences with GSWU organizers, or just share an opinion, we promise to keep your identity protected. "I support your cause, but I don't want to get involved..."
That's cool. Even if you don't get in touch with us, you can still help put a stop to GSWU by talking to your friends and collegues about this issue and why you believe that it isn't in their best interest to allow UAW to be their exclusive representative. If you or your friends have questions in the course of your discussions, don't hesitate to get in touch. "Do you have any cool posters?" Yes, and we will be adding to these lists. $600 Million in Unrestricted Funds? Are You Paid On a Grant? Please place posters only where public posting is allowed. Please do not tape these posters to walls. Please do not remove UAW-GSWU posters unless they are not posted in allowed places. All posters must be placed on bulletin boards (not taped to walls or windows, etc.). "Do you have pics of these posters in action?"